Amazon is back with its Fab Phones Fest for the month of April 2019 in India. The sale on Amazon India is live and will go on till April 13. With upto 40% off on mobile phones and accessories, there is something for everyone. From premium smartphone such as the OnePlus 6T,which has been discounted for the first time ever, to budget phones like the Redmi 6 Pro, there are plethora of options to choose from. 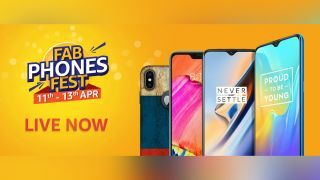 Below, we have listed the best deals and offers on smartphones that are on sale during the Fab Phones Fest by Amazon India. This might be a good time to replace your old smartphone as there is an exchange offer on some of the popular phones. During the Amazon India Fab Phones Fest sale, OnePlus 6T is being offered with a discount for the first time since its launch. The OnePlus 6T with 6GB of RAM and 128GB storage which is originally priced at Rs 37,999 is selling for Rs 34,999 during the sale. That's a flat discount of Rs 3,000. Another variant with 8GB of RAM and 128GB storage is retailing for Rs 37,999 as opposed to its original price of Rs 41,999. Amazon India is offering a flat Rs 4,000 discount on this OnePlus 6T model. During the mobile phone sale on Amazon India, the Redmi 6A by Xiaomi is selling for Rs 5,999, down from its original price of Rs 6,999. This is the variant with 2GB of RAM and 16GB of internal storage. The second variant with 2GB RAM and 32GB of storage is retailing for Rs 6,499 which is a flat discount of Rs 1,500 on its original price of Rs 7,999. Redmi 6A is available to purchase in black, blue, gold and rose gold colour options. Oppo F11 Pro featuring a pop-up camera was launched for Rs 28,990. It has received a flat discount of Rs 4,000 which reduces its original retail price to Rs 24,990. The phone is available to purchase in Thunder Black and Aurora Green colour hues and has 6GB of RAM and 64GB storage. There is an exchange offer on the F11 Pro which is providing a discount of Rs 13,950 on old smartphones. One of the bestselling mid-range phone by Xiaomi, the Mi A2 is available for Rs 11,999 on Amazon India during the Fab Phones Fest sale. This is the model with 4GB of RAM and 64GB storage. The 128GB storage variant has also been discounted and is now selling for Rs 15,999 including a discount of Rs 4,501. The Mi A2 comes in black, blue, red and gold colour options to choose from. There's an exchange offer on the Mi A2 under which it can get a discount of upto Rs 13,450 in exchange of old phones. Huawei's last year flasghip phone, the Mate 20 Pro was launched at Rs 71,990. It is available for Rs 64,990 after a flat discount of Rs 15,000 and has 6GB of RAM and 128GB storage. In addition, there's an exchange deal which offers a discount of upto Rs 11,450 on replacement. Honor View20 is available for Rs 37,999 during the Amazon India sale with 6GB of RAM and 128GB storage. The top-end model with 8GB of RAM and 256GB of storage has also received the same discount and now sells for Rs 45,999 instead of its original price of Rs 50,999. Under the exchange offer, the Honor View20 is eligible to get upto Rs 11,450 off on exchange of old phones.